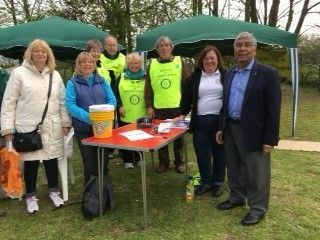 At the May Day Fayre on bank holiday Monday, in the grounds of Meopham Primary Academy, Rotarians were out in force, promoting Stroke Awareness and ShelterBox. Rotarians from all three of the local Gravesham clubs invited adults at the Fayre to have their blood pressure taken by professionals (doctors & nurses) as part of the Stroke Awareness campaign. I am glad to report that despite the burgers, ice cream, sweets and drinks being sold, those adults tested proved to be a fairly healthy bunch. ShelterBox literature was handed out and children, who seemed to know almost as much about the boxes as the Rotarians, explained to their parents how ShelterBox helped families in disaster areas. The Fayre was well attended and although the morning started with a chilly breeze, the sun soon came out to warm everyone’s spirits – a good day was had by one and all.